They travel laterally as well as posteriorly above the bodies of the lumbar vertebrae, proceed laterally, going posterior towards the sympathetic trunks and in between the transverse processes of surrounding lumbar vertebrae, and also reach the abdominal wall. There are generally four sets of lumbar arteries emerging from the posterior side of the abdominal aorta. From this point forward, they demonstrate a division pattern just like a posterior intercostal artery that includes giving segmental sections which supply the spinal cord. The upper four sets of these arteries emerge via the posterior side of the abdominal aorta. They pass laterally on the surfaces of the bodies of lumbar vertebrae and after that backwards deep to the psoas major. The fifth set of lumbar arteries is generally represented by the lumbar branches of the iliolumbar arteries. However rarely they might emerge out of the median sacral artery. They run lateral ward along with backwards on the bodies of the lumbar vertebrae, at the back of the sympathetic trunk, to the spaces in between the surrounding transverse processes, and are then extended within the abdominal wall. 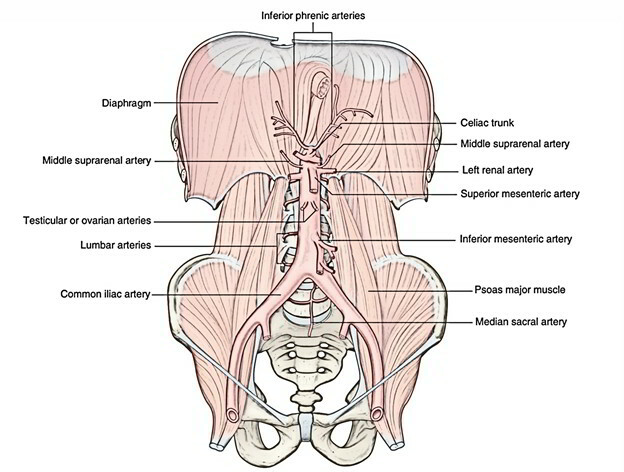 The arteries of both sides pass below the tendinous arches that give rise to the psoas major, and are then extended behind this muscle and the lumbar plexus. The arteries of the right side travel behind the inferior vena cava, and the upper two on each side go at the back of the matching crus of the diaphragm. They now go across the quadratus lumborum, the upper three arteries running behind, and the last normally in front of the muscle. At the lateral border of the quadratus lumborum they pierce the posterior aponeurosis of the transversus abdominis and are continued in between this muscle and the obliquus internus. Dorsal branches that generate the spinal branches that goes into the vertebral canal. Dorsal muscles of the back, fascia, ligaments, vertebrae along with intervertebral discs.